Guy Wong's ramen operation sets a fine stage at Ponce City Market. : Gaining fame from his Miso Izakaya, Atlanta-reared Guy Wong studied cooking in Japan, although he grew up in his parents' Chinese restaurant. 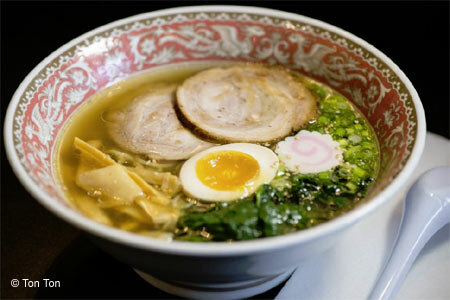 Lacking a sign making it a bit difficult to find in the Ponce City Market food court, Ton Ton showcases Wong’s approach to ramen, with full-flavored broths and noodles you'll have no trouble slurping to the very last. Broth hits the palate with rich, dense flavor. We opted for the tori shoyu. Fermented bamboo shoots, half a soft-cooked egg and spinach dot the surface in addition to two thin slices of pork belly that didn't supply much taste. You can up the ante with a chili paste bomb for an additional 95 cents, but we didn't bother with soy sauce so the foundational flavors the bowl offered could be enjoyed. Yakitori was supposed to be part of this concept, but the menu is still all about ramen. Look for appetizers --- gyoza and wings, for instance --- but only a few. No alcohol (yet) and no dessert. There are two seating arrangements: a ramen bar with backless bar stools and table seating (get a table).